Geckos use a combination of techniques to race across water. The flat-tailed house gecko can not only stick to walls and glide through the air, but also run on water, a new study finds. This discovery of the combination of techniques the reptile uses to race across water could one day lead to robots capable of the same feats, researchers said. The flat-tailed house gecko (Hemidactylus platyurus) is a common pet reptile native to southern and Southeast Asia. Not only can bristles on its toes help it climb walls and hang from ceilings, but it can glide with the aid of its webbed feet and skin flaps. "They're kind of like superheroes -- every time you look at them, they can do more things," said study senior author Robert Full, an integrative biologist at the University of California, Berkeley. (Pauline Jennings/UC Berkeley via PolyPEDAL Lab) A flat-tailed house gecko runs on the surface of water in an undated handout photo. The newfound talent of this species was discovered by study co-author Ardian Jusufi, a biophysicist now at the Max Planck Institute for Intelligent Systems in Stuttgart, Germany, when he was in a rainforest in Singapore and saw the geckos skidding across puddles to escape predators. 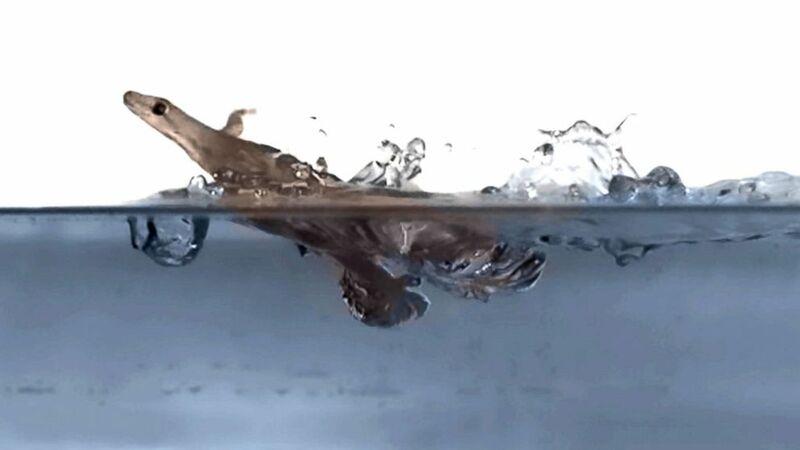 Lab experiments with these reptiles found they could run up to nearly a meter per second over 8 centimeters of water, faster than the swimming speeds of many aquatic creatures, including ducks, muskrats, juvenile alligators and marine iguanas. They could also easily switch to dashing across solid ground or scampering up a wall. More than 1,200 species of animals have evolved the ability to walk on water, ranging from tiny creatures such as insects and spiders up to larger beasts such as reptiles, birds and even mammals. Small animals such as water striders are light enough for their weight to be almost entirely supported by the surface tension of water -- the same fluid property that makes water droplets bead up. In contrast, relatively big animals such as the basilisk lizard must slap water with enough force and speed to keep their heavy bodies from going under. However, the flat-tailed house gecko's size posed a mystery as to how it could run across water. At roughly 6 grams in weight, the mouse-size reptile seemed too heavy to rely on surface tension, but too light to generate enough slapping force to keep their bodies above water. The scientists devised experiments where they varied the surface tension of water by adding soap and shot high-speed video of the geckos darting across these liquids. By closely examining the geckos' movements and estimating the forces involved, the researchers discovered that the animals combined up to four strategies to run across water. "Geckos are unique in combining all these tactics," Full said. Surface tension was essential to the reptile's success -- eliminating surface tension with soap halved gecko speed. However, even without surface tension, the lizard could sprint across the water using slapping movements with all four legs, which created air pockets that helped keep their bodies from completely submerging. The scientists also noted these geckos had super-water-repellent skin. They suggested this could help the reptiles skim across the water, a technique known as semi-planing that is also used by muskrats. It is similar to hydroplaning, the phenomenon that can make tires slide across wet roads. Lastly, the geckos undulated their bodies and tails. "It looks just like they're swimming," Full said. "We think they probably get some propulsion from it." Future research could investigate if other lizards can run on water like geckos. "It might be that many others have this capability," said biomechanist Jake Socha at Virginia Tech in Blacksburg, who did not participate in this study. Scientists can also see whether this gecko changes how it moves over time. "Might it transition from one locomotion strategy to another as its size increases?" said fluid mechanician John Bush at MIT, who did not take part in this work. All this research could one day help develop geckolike robots for search and rescue missions in flooded areas. "We could one day see robots that could run and climb and race across the water," Full said. "Pretty unstoppable, like a superhero." The scientists detailed their findings online Dec. 6 in the journal Current Biology.